In which I demonstrate my awesome debugging workflow, and ramble about BleakHouse and Ruby’s memory behavior. I’ve been running BleakHouse in actual, deployed production on CHOW, and have learned some interesting things. The ruby-bleak-house build (which is really Eric Hodel’s work) is rock stable. Every deployed Ruby process on CHOW runs the patched build. BleakHouse itself is not enabled—the point is to have the symbols in place for emergencies. Some poor user just got their request hung. Hopefully they’ll refresh it and get shifted to another mongrel. Ah, there wasn’t a request after all. We’re just in the mongrel wait loop. Now we know it’s not some particular action jammed up and eating memory. More likely, it’s a slow leak. Well, what does the heap look like? Evaluation of the expression containing the function (rb_p) will be abandoned. (gdb) eval "BleakHouse::CLogger.new.snapshot('/tmp/objs', 'gdb', true)"
Detaching after fork from child process 29366. Fork? Ok, whatever. Is the objs file there? Our resident set size is very large. 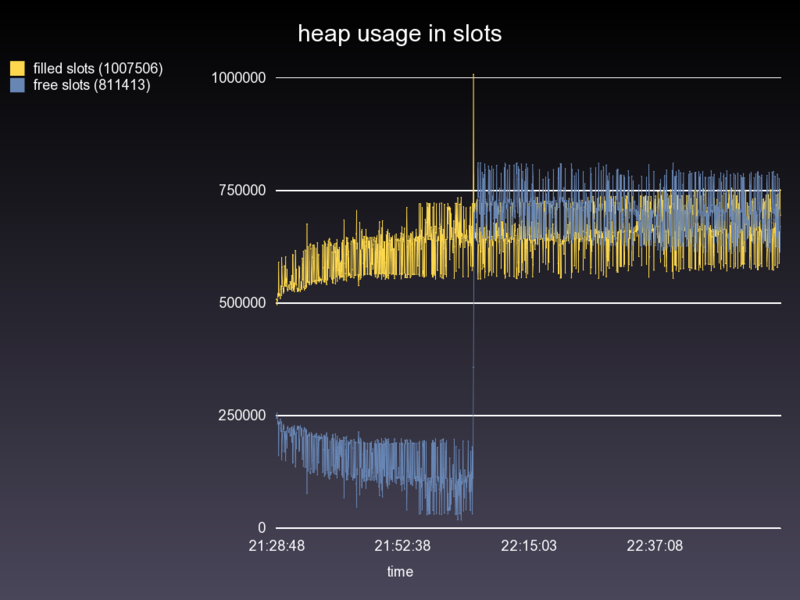 But there really aren’t that many filled slots in the Ruby heap. Maybe the usage shot up at one point, and then dropped back down. Maybe there’s a single array of immediate types that grows and grows, or something. Well, the node count is about the same, which means there isn’t any leak in the AST itself. And the filled vs. free looks much more normal. So…we didn’t learn that much. What to do? Let’s make some heapspace fireworks. BleakHouse is pretty fast. So rather than simulate some crappy usage scenario, I shut down monit and swapped out one of the regular mongrels for one with BLEAK_HOUSE=true. Yeah—BleakHouse itself running in production mode on the live site. It worked great. I restarted monit and eventually the process got big enough that monit killed it. 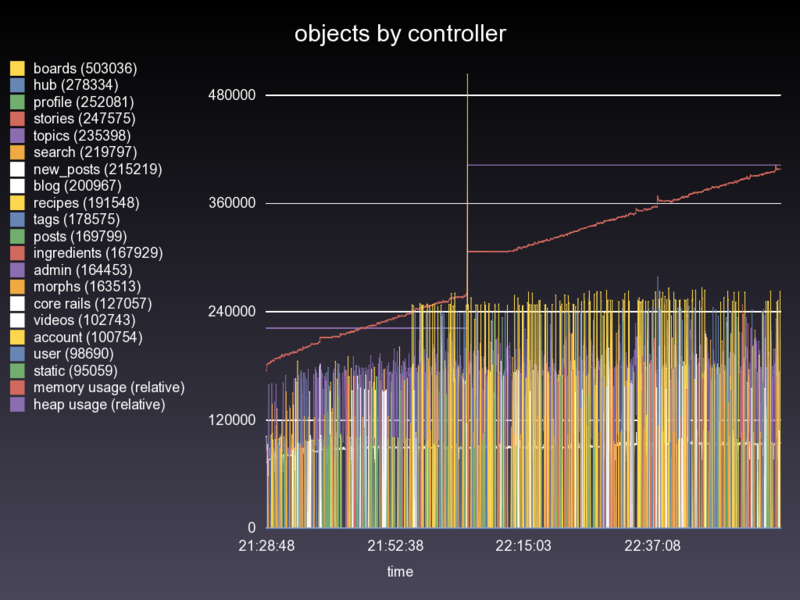 Then, I copied bleak_house_production.yaml.log (all 147MB) to my local machine, and analyzed it. Let’s look at the graphs. What a beautiful graph! And it verifies my guess from above—the filled slots stay within the same general bracket the whole time, but around 22:05 there is a huge, temporary need for lots of objects. Those slots then persist for the rest of the life of the process. Looks pretty much fine. Although it shouldn’t really have an /unknown path…that’s a minor BleakHouse::Analyze bug. The graph does have a slight upward trend, but basically stays within a consistent bracket after an initialization period. The continuing increase is probably some application code leaking objects, which then get misidentified the next time core is logged and tagged. Hrm, ok, well that’s an awful lot of strings. The boards are one of the most heavily-trafficked sections of CHOW, so a leak there will eventually bring down the whole process. 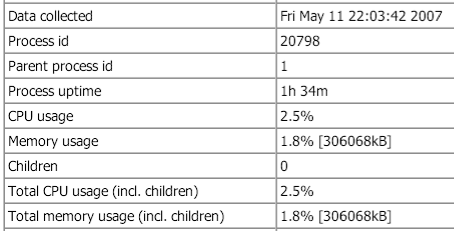 Incidentally, CHOW gets about a 1/2 million page views per day. And then…kill the fucker. But that will have to wait for another day. BleakHouse is getting a lot of attention. There’s an InfoQ article, and one on Ruby Inside. 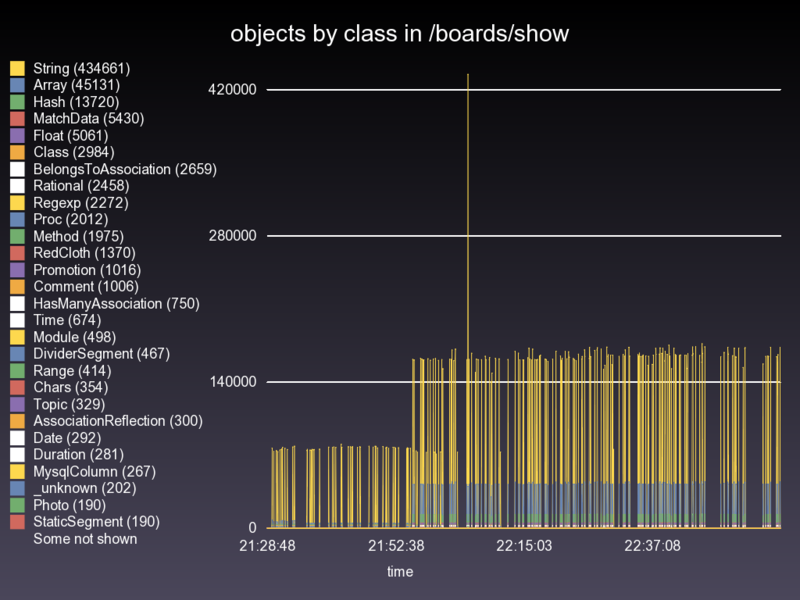 Lourens Naudé wrote some notes about memory usage and used some BleakHouse code. And the Solaris DTrace team sent me a mail. Incidentally Lourens references the same critical thread that I had been discussing with various people last week. 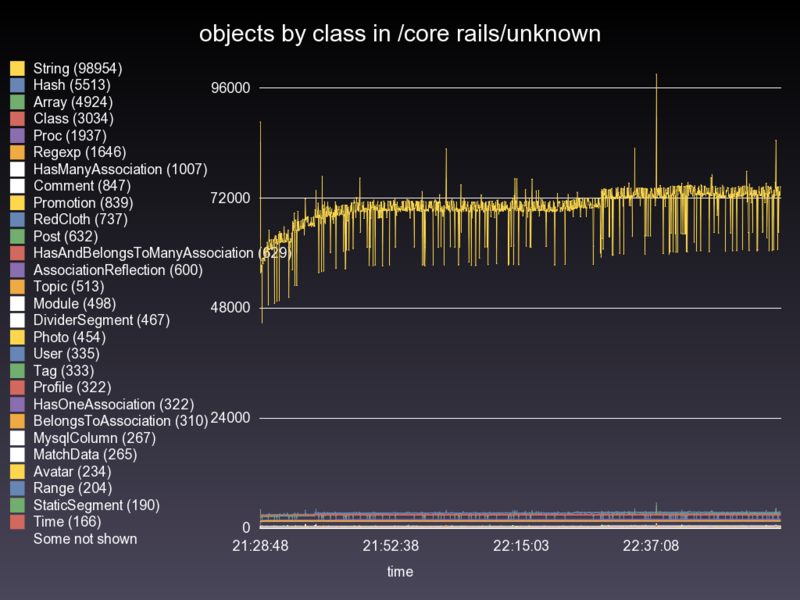 Also, the Ruby heap has a tendency to request memory from the OS and never give it back, even if the need goes away. This is normally fine, because unused portions of the space get swapped out. However, if your system is underloaded, there might not be any need to swap. 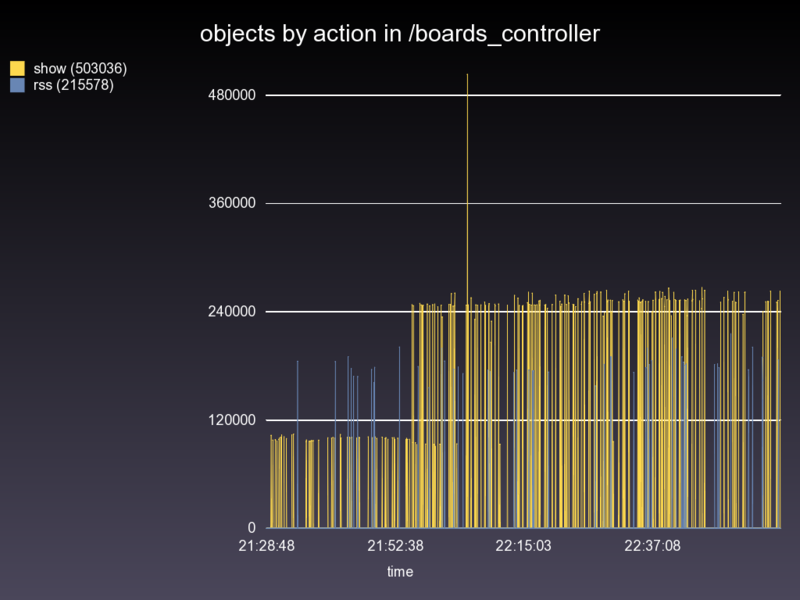 This can give false impressions of the physical memory footprint of your app. On the other hand, it would be nice if Ruby would just give the space back. I gave BleakHouse its own documentation page. Evan, what a great article. I really look forward to seeing a writeup on what the bug is and how you tracked it down all the way; these are great examples. I would also love to hear what the DTrace team had to say. MacPorts users, note that Mauricio’s scripts don’t work on the Ports build of Ruby—it’s missing debugging symbols or something. The scripts work with the BleakHouse Ruby binary, though. For ultimate convenience, rename the Ports ruby and symlink /opt/local/bin/ruby to ruby-bleak-house instead. I’ll just say this is probably the most useful damn thing for Ruby in a long time. I really wish I’d had it when I was ghetto trolling through ObjectSpace tracking down that memory leak that supposedly didn’t exist in Threads and Arrays.